ExpressVPN vs PureVPN. Which of these top providers should you choose, and what do they have to offer? We’ll take you through what to look for if you’re trying to decide between the two. Overall, we’d opt for ExpressVPN because of their blistering speeds and the quality of their customer service. They have a generous refund policy in comparison, and they’re trustworthy when it comes to your personal data. Read on to find out why it’s a sure-fire winner. PureVPN has been up and running since 2007, expanding their network into one of the biggest worldwide. They’re recognized as a solid provider for a range of tasks, including streaming and gaming. ExpressVPN, established in 2009, offers a premium service, with speeds that are capable of matching, (and in most cases, beating) their competition. They’re well respected as a result, and it’s always a great option if you want a new VPN. Our team has analyzed and tested both providers extensively to give you the lowdown on how they match up. It should give you a better idea of which one will be right for your needs. ExpressVPN offers high-speed servers that are available across the globe, with multiple locations in the US and the UK. They’re one of the fastest in various regions, and we had no issues with the service given the speeds and consistency. They promise uptime at a rate of 99.99%, so there’s little chance of encountering problems when connecting to their servers. PureVPN has coverage in over 140 countries, with 750+ servers in total. They’re clearly ahead in this regard, but their service isn’t as reliable when it comes to maintaining optimal speeds for extended periods, and it’s slightly slower than ExpressVPN overall. They compensate with specialized servers for high-intensity tasks like gaming and streaming, so the difference isn’t that noticeable during use. If you plan for use on multiple devices, you’ll be pleased to hear that ExpressVPN allows for three simultaneous connections, while you can use five with PureVPN. Each offer unlimited bandwidth with no caps, making them a solid option if you’re looking for a VPN that can handle extensive use. Here are six key features that we’ve used to separate the two providers. Available Streaming Services: ExpressVPN and PureVPN are posited as ‘great for streaming,’ and they provide the goods for the most part. ExpressVPN is the only one that will give access to US Netflix, making it highly desirable if you want the very best version of their service. Nonetheless, each have great speeds for watching content. Mobile Apps: Both have the typical range of mobile app support that you’d expect from two of the biggest VPN providers. 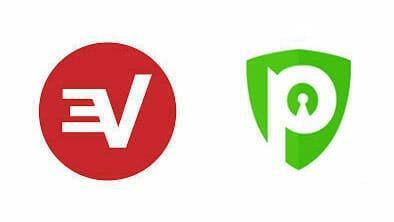 Having apps for both smartphone operating systems, PureVPN ExpressVPN are top VPNs for Android and iPhone. Protocols: Protocols allow the user to connect to the VPN in different ways, so a wider range of protocols are always preferable. They both have OpenVPN, PPTP, L2TP, SSTP, and IPSec, while PureVPN also offers IKEv2 (see more on VPN protocols). Speeds: As we’ve mentioned, you’ll find blistering speeds with ExpressVPN, while PureVPN isn’t far behind (we chose to mention the 6.5% based on 2.65 Mbps difference in download speed reported on PureVPN review). Anyone with a slower internet connection will definitely appreciate the power, which should help you to avoid buffering. Payment Options: Both have a large range of payment options, including PayPal and Bitcoin. Browser Extensions: Browser extensions are an easy way to provide an added layer of security if you’re using a desktop device. ExpressVPN has a decent Chrome extension that will spoof your location, while PureVPN is available on both Chrome and Firefox. They’re similar in terms of protocols, while each have secure AES-256 encryption. Neither will log your traffic, but they do log bandwidth usage and time stamps. You can use ExpressVPN over Tor, while PureVPN also works with .onion websites. In light of the above, we’d have to go for ExpressVPN between the two. Customer service is highly important to ExpressVPN. They have live chat options for an instant response to any problems, while they offer a decent variety of setup and troubleshooting articles. PureVPN only have a contact form which comes with an average response time of a few hours. If you’re hoping for a money-back guarantee, it’s another win for ExpressVPN. They do offer a refund for the first seven days of service, but ExpressVPN will reimburse you for up to a month. There’s a slight difference in pricing between the two providers with a couple of special offers that we’ll discuss in-depth. ExpressVPN has been marketed as a premium VPN – and it’s reflected in the price. It’s more expensive than your average provider, but it’s offset by the speeds they offer. Their 12-month deal does come with three months thrown in which is a decent saving in the long run, but they can’t match PureVPN when it comes to savings. If you’re looking for the best value for money there’s a clear winner; and it’s PureVPN. You’ll struggle to find a better offer than their 24-month package which comes in at $2.45 per month, and it’s the perfect option if you’re on a tight budget. Our overall winner is ExpressVPN, although it’s not as clear cut as you may expect. They do have the edge when it comes to speed, Netflix, and customer service, but that doesn’t mean that PureVPN isn’t worth checking out as an alternative. Despite stories concerning their logging policies, PureVPN price alone makes it great for non-stalking activities, and it’s close to matching up in terms of features and speeds. ExpressVPN vs PureVPN wasn’t really a mismatch, with each highlighting why they’re seen as a couple of the best providers available. More on our top choices VPN reviews.